Baseball and Fireworks!!! What a perfect pair! Today marks a great day for all baseball enthusiasts as it is Opening Day 2014. Baseball teams across the country will open up their official 2014 season today and most will start with a bang! Pyrotechnic celebrations will be used across the country tonight and we could not be more excited to be a part of this amazing tradition. Baseball happens to be deep in our roots here at Melrose. Bill Veeck, new majority owner of the Chicago White Sox, was known for doing new and sometimes crazy things to get people to the ballpark. In 1959, he called on Anthony Cartolano at Melrose to try something innovative—shooting fireworks for Sox games. What a hit! Fans were thrilled. Sox home attendance reached a record 1.4 million in 1959. The Sox won their first pennant in 40 years. In 1960, Bill Veeck’s vision, along with the expertise of Anthony and the Melrose team, led to another creation—The Exploding Scoreboard. With their imaginative collaboration, Melrose Pyrotechnics began entertaining the audience every home game with a new type of home run celebration never seen before. Nichole Manning, Senior Director of Game Operations for the Chicago White Sox, truly enjoys working with Melrose Pyrotechnics for the fireworks and pyromusical entertainment at the White Sox games. A tradition since 1959, Melrose creates the extra excitement at US Cellular Field that “always gets a great response,” says Manning. Melrose engineers everything from pre-game barrages to post-game celebrations, according to Manning. In a ballgame, the needs are fluid and require exceptional creativity, she adds. “I love their home run blasts. It’s always easy to pick up and keep moving with the Melrose team.” Manning finds the team “very open, kind, and pleasant. They’re a close-knit group. Melrose is like part of the family,” she says. Baseball, along with pyrotechnics of course, runs in our blood here at Melrose and undoubtedly helped us get to where we are today. We could not be more excited for the start of this great American sport and look forward to thrilling each and every spectator at every fireworks display this season. Watch out for our fireworks at the Chicago White Sox Home Opener tonight!!! What else do you need in the pyrotechnics industry? Well, other than copious amounts of hard work, passion and dedication, you need the American Pyrotechnics Association (APA). The APA was established in 1948 and formed by leading fireworks manufacturers as a way to come together to address industry wide issues in a way that benefited all companies in the industry. With pyrotechnics, safety always comes first and the APA makes sure of this. Their mission is to not only provide information and support to its members, but also, to encourage safety in design and use of fireworks as well as promoting regulation of the entire industry. They do this by working year round with the Department of Transportation, the Bureau of Alcohol, Tobacco, Firearms, and Explosives, and the Consumer Product Safety Commission. They serve as our voice in this highly regulated industry! While the APA was created as a form of regulation for the pyrotechnics industry, they strive to develop codes and standards in a way that promotes safety, but does not place too much restriction on the industry. Along with being our voice, they provide all members with technical, regulatory and legal expertise, as well as safety and training information in the constantly changing environment of this industry. The APA works hard to improve this industry and invest in its future. 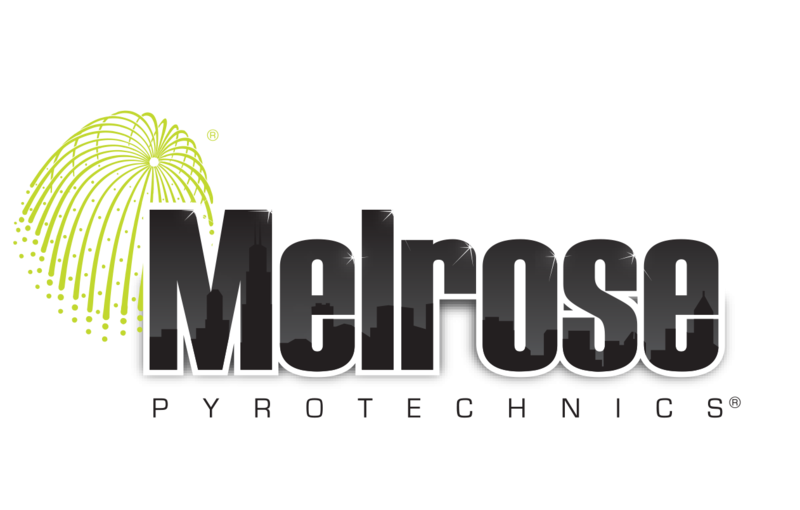 We here at Melrose Pyrotechnics are happy to be part of such a great association and can’t imagine where the industry might stand without the American Pyrotechnics Association today. Picture this…You are in the heart of Valencia, Spain and all of a sudden loud bangs and flashes of light begin, all coming from inside of a metal cage. This is no mistake, it is known as a mascletà. Today marks the 3rd day of Las Fallas in Valencia, Spain. As promised we wanted to highlight one of the most important events of this festival, the mascletàs. Pyrotechnicians from the city set up and perform these each day, March 1st-19th. While most fireworks focus on the appeal to sight, mascletàs are aimed at stimulating people through rhythmic noises. They are all contained in a metal cage that a crowd of people surround for the first 19 days of March in Valencia at 2pm. Firecrackers, or masclets, are hung by strings and set up in a way to make these rhythms and perfectly choreographed explosions and sounds. A mascletà typically has four parts to it. The first part is the opening, in which the sound and visual effects begin. This part is less intense than the rest of the show and short in duration. The body of the show builds with intensity and volume. The third part of the show, or earthquake, is the most intense. At this point numerous lines of masclets are exploding at the same time and increasing in intensity. The final stage is more aerial than the rest and increases in intensity. It involves more color than previous parts of the show and ends with deafening sound. Smoke and the smell of gunpowder fill the air and the crowd goes wild. Tomorrow starts a traditional festival of Las Fallas in Valencia, Spain. This festival dates back to the middle ages and pyrotechnics play a huge role throughout the entire festival. During the middle ages, excess winter supplies were burned as a sort of spring cleaning marking the start of the season. The spring season brought on more sunlight, which replaced candle light. Carpenters and artisans burned the wood pieces, called parots, that they used as wick holders through the fall and winter months. This tradition kept growing and the festival of Las Fallas was created. This festival is held March 15-19th every year in Spain. It consists of daily wake up calls known as despertà given by the Falleros at dawn. How do you wake up an entire town? By throwing hundreds of tró de bac (local firecrackers) at the ground. These loud noises are sure to wake up the streets. Then in the early afternoon of each day the mascletàs take place (stay tuned for more information on this loud pyrotechnic event). More exciting pyrotechnic shows take place each night leading up to the Nit del Foc or Night of Fire. This happens in the night between the 18th and 19th and combines color, light, fire, and explosion to create a spectacular display of pyrotechnics. All of these events lead up to the final day of Fallas, which ends with the Cabalgata del Ninot or Fire Parade in the streets of Valencia. Inspired by the upcoming Passfire documentary and their production team’s latest travels to Mexico, we are highlighting Mexican firework traditions. Tultepec is considered the fireworks capital of Mexico and they produce pyrotechnics as small as firecrackers, all the way to large shells. Mexico is most known for huge pyrotechnic frames called castillos (castles) and toritos (little bulls). These are elaborate structures that, once fireworks are added, can be synchronized to music and light creating an amazing spectacle. Castillos are typically made of wood, reeds, and paper and have fireworks attached to them. These structures move and create images and stories for spectators. After a castillo is set off, it can take up to thirty minutes until all the features are done and complete. Toritos are wood, reed, paper mache, and wire structures shaped as bulls then, like castillos, fireworks are attached. They are usually painted bright colors and can have as many as 4,000 fireworks attached to them. Toritos are named after the traditional Running of the Bulls in Spain. 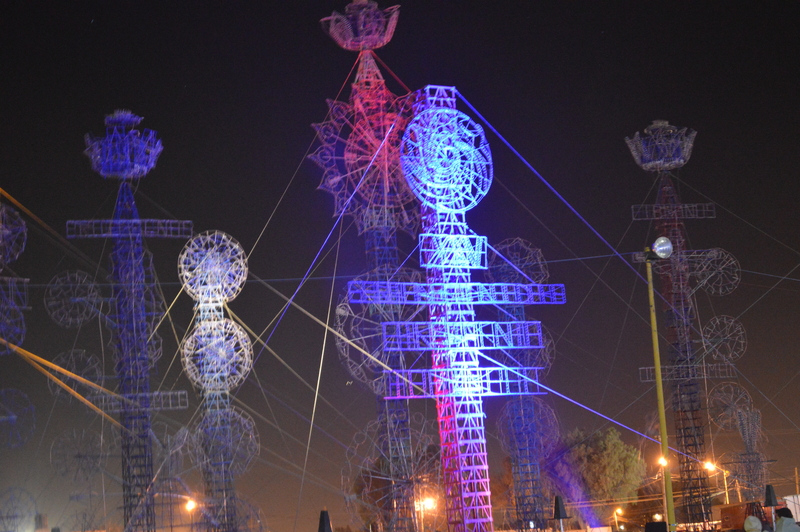 Contestants who make these structures parade them throughout the streets before putting on a performance and lighting them. 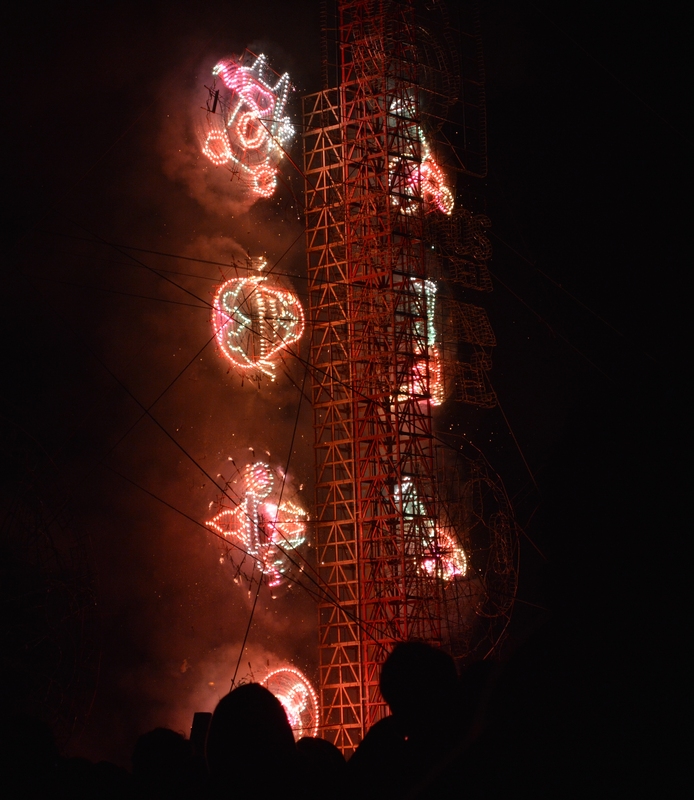 Not only are castillos and toritos part of Mexican traditions, but fireworks as a whole. Mexico has been producing and using fireworks since the mid-19th century and it is a long standing tradition celebrated with the National Pyrotechnic Festival every year in Tultepec, State of Mexico.